Fabian Heuwieser BlackBerry Apps on Sale for 99 cents! Let the sales on awesome applications keep rolling. Fabian Heuwieser (@FabianMH on Twitter) has also posted all of his great apps on sale for just $.99 cents up until May 31st. No coupon code required. 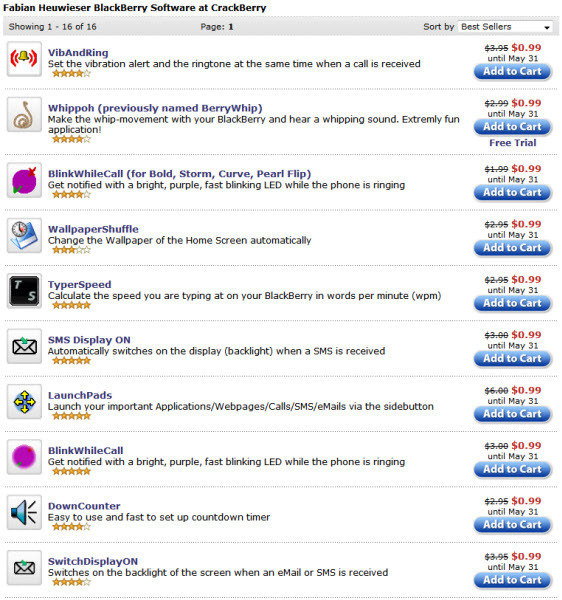 There are lots of popular titles here, including VibAndRing, BlinkWhileCall and my personal favorite time waster TyperSpeed! Also, while your perusing the paid applications, Fabian also has some great free apps as well.